Since October 2009, a strange contraption-all metal pipes, wires and sensors-sat smack in the middle of the Central Rice Research Institute (crri) near Cuttack in Odisha, inviting the dedicated attention of a handful of scientists there. Fenced in by an iron mesh, the device was planted in the midst of lush green rice fields on the 1-hectare campus-and it played a key role in helping researchers at the country’s premier rice institute to arrive at a different understanding of what this important food crop is doing, or not doing, to our planet by way of greenhouse gas (GHG) emissions. The apparatus that was employed by crri scientists is called the eddy covariance (EC) system and is widely favoured by scientists across the world to measure the exchange of carbon dioxide, water vapour, methane, various other gases, and energy between the surface of earth and the atmosphere in different ecosystems. Advanced versions are increasingly being used by rice scientists to arrive at a fairer measure of emissions in rice ecosystems which have for long been targeted as major villains in pushing up agricultural GHGs. 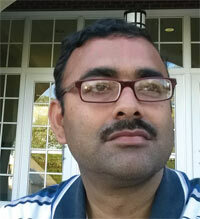 For Pratap Bhattacharyya, senior crop scientist at crri, the EC technique has been instrumental in formulating his thesis that rice is actually a carbon sink. In a paper published in May this year in the internationally peer-reviewed journal Agriculture, Ecosystems and Environment, the scientist says considering that 80 per cent of rice in Asia is grown in flooded conditions, it was essential to determine whether such a system is behaving as net carbon sink, that is, absorbing carbon or adding to its depletion. After a year-long field study undertaken in 2012-13 to investigate the carbon dioxide (CO2) and methane (CH4) exchange in relation to ecosystem carbon balance, the paper states clearly that lowland flooded rice ecosystem has the capacity to store carbon in the soil and can behave as net carbon sink. CO2 and CH4 are the two major GHGs that contribute to global warming by trapping heat on the surface of the earth. This finding goes against the conventional view that tropical rice fields are major contributors to agriculture GHGs. The latest working group report of the Intergovernmental Panel on Climate Change (IPCC) squarely blames rice for climate change, saying that rice paddies account for as much as 11 per cent of man-made methane emissions. This is estimated at 493-723 million tonnes of CO2 equivalent a year and major rice-growing countries such as India and China have been under pressure at climate change negotiations to include agriculture emissions in their total GHGs with rice cited as the chief culprit. However, the crri research team, which includes principal scientist A K Nayak, arrived at its contrarian view by toting up the net gain/loss of carbon and then calculating the carbon lost from the system through dissolution in water, erosion, harvesting and bacterial production of methane to arrive at the “net carbon balance”. They say that a hectare of lowland ecosystem has the potential to store as much as 910 kg of carbon during the wet season while in the dry season, it can hold up to 590 kg. In an interview to Down To Earth, Bhattacharyya explains why he arrived at this hypothesis. His team observed that geographically lowland rice-growing areas are confined to the coastal states having high annual rainfall. The lowland rice cultivation is usually a bunded system in which the field bund height ranges from 50 cm to 100 cm. Typically the rice fields act as perfect water harvesting structures and help in reducing the run-off loss and enhance the groundwater recharge, thereby helping to prevent the salt water intrusion into aquifers in coastal areas. In the absence of these rice fields and bunded structures, the water would have been lost to sea and contributed to decline in groundwater, he contends. “In the absence of rice fields there would have been much higher expenditure for rainwater harvesting and artificial recharge of aquifer along with the use of electricity and petroleum needed for extracting water from a still deeper layer of aquifer which would have further contributed to climate change.” (see ‘Build up a national database on GHGs’, p 39) But not all scientists subscribe to the view that “Tropical lowland rice ecosystem is a net carbon sink” as the Bhattacharyya paper is titled. Reiner Wassmann, coordinator of climate change research at the International Rice Research Institute (IRRI) in Los Baños, Philippines, for instance, has a problem with such a broad claim. Interestingly, Wassmann, in a paper written with fellow IRRI scientist Maricar Alberto, has also reported net CO2 uptake along with CH4 emissions using the same EC measurement technique. In the paper “Measuring methane Â´Â¼Ã©ux from irrigated rice Â´Â¼Ã¼elds by eddy covariance method using open-path gas analyzer” published in the journal Field Crops Research in April this year, Wassmann says intermittent irrigation during the vegetative stage was an effective water management strategy to lower the seasonal CH4 emissions. The researchers used the newly developed LI-7700 open-path methane analyser to measure CH4 fluxes from irrigated rice fields. The study abstract concludes that the irrigated rice field is a carbon sink, but in their analysis of Bhattacharyya’s findings, Wassmann and Alberto point out their paper “does not make any generalised statement” as the crri scientists do on tropical lowland ecosystems. This may be a confusing response since both papers have similarities, but Wassmann is clear on one point. “I don’t think that we have to re-assess the overall perception of rice fields as sources of methane, and thus a net source of GHGs.” He says that rice fields can take up carbon for some time which may compensate for CH4 emission in given seasons, rendering this field a temporal sink of GHGs. “But if we assume that carbon uptake is a long-term process, one has to ask where all this carbon would actually end up? The only conceivable ecosystem compartment for long-term storage of carbon is the soil as the vegetation carbon pool is in a steady turnover,” says Wassmann. "The paper assesses the carbon mass balance and not the balance of greenhouse gases"
His contention is that accumulation of carbon in soils is a finite process that cannot go on forever, except in peat soils, which are very distinct from rice soils. “Some rice soils have been cultivated under flooded conditions for centuries-and the soil organic carbon in these soils is not much higher than in soils that have been converted to flooded rice in relatively recent time,” says Wassmann. Any change in the cropping system, such as, moving from an upland crop to flooded rice, will sequester carbon only till a new equilibrium in soil organic matter is reached. In response, Bhattacharyya points out that the crri paper did not state that lowland rice ecology is a CH4 sink. “We converted all possible input and output of carbon (including CH4) and used advanced EC method to estimate net exchange. Considering all the components of carbon balance on system basis, this ecology had a good potential to store considerable amounts of carbon,” says he. This means the final word is yet to be declared on whether such rice fields are, indeed, carbon sinks. 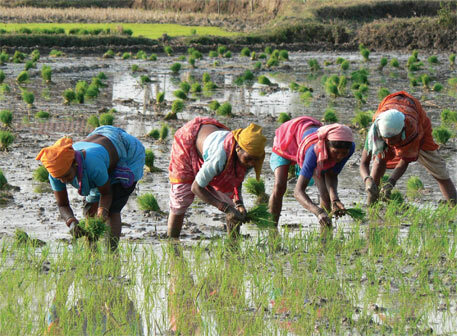 What made you look at the issue of greenhouse gases (GHGs) from rice from a different perspective? technique. 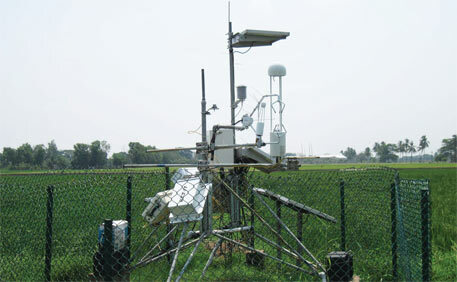 The EC technique is a standard micrometeorological method to monitor and determine real time fluxes and net balance of CO2 and CH4 between the terrestrial ecosystem and the atmosphere. What did this system tell you about rice? It is clear that lowland rice is a source of methane (in kg/hectare scale) but the CO2 exchange is negative and quite larger in scale than methane. Therefore, our approach was to see if we convert all input and output, including CH4 and CO2, in carbon terms and ecosystem basis in lowland rice whether the system behaves as a source of GHGs or a carbon sink. Considering the net ecosystem production (with rhizodeposition, algal biomass, root, stubble and compost added) along with the carbon input and removal, tropical lowland rice acts as net carbon sink, both seasonally and annually. What are the implications of your findings for India? The findings should stimulate a thinking process whether there can be zoning of rice areas that are favourable from climate change point of view and these areas should be nurtured. Understanding the processes and components of net ecosystem carbon budget in lowland flooded rice paddy is essential to know whether the system is behaving as net carbon sink or carbon source. This should also hold good for other major cropping systems in India like ricewheat, rice-maize and wheat-soybean. We should build a national database on GHG emissions in particular and estimation of global warming potential (GWP) based on ecology and cropping systems. Thanks to the findings of crri. Carbon Sink or Carbon Source; the crri, irri etc should suggest more strict environmental regulations to favor/ support/ protect the paddy fields. Should not forget their high potential in water harvest! Promote small farms/ farming in the country to support the local food requirements. It is not required to produce the grains in Punjab and ship all the way to Kerala if the same grain can be produced locally in Kerala. Our local self government bodies should be more innovative in supporting the local farmers and small farms. but how much% methane emmission is GHG from rice fields? i want to someone to carry out scientific check on the methane release by cows on farms too. AGAVE and OPUNTIA being CAM plants are Carbon Sink. Plant them on a massive scale in waste lands to use them in Biofuel and Biogas power generation.